Many brides and grooms dream of a luxury Cabo wedding on soft sands with a tropical breeze at sunset and an intimate moment with family and friends in paradise as they commit their love to their partner. The idyllic and gorgeous Los Cabos wedding venues on the beach add touches of natural elegance and uniqueness to destination weddings, which has made Los Cabos one of the top destinations for sophisticated and stylish weddings. Make your dream wedding a reality and take advantage of the Cabo wedding packages and services that will make your day a luxurious and romantic fairytale. Cabo beach weddings offer a wealth of natural beauty that sets the ultimate backdrop for a stunning ceremony. With a blanket of sandy beaches stretching on, lush palms swaying overhead, and the sound of rolling waves crashing on the shore, Los Cabos wedding venues by the seaside provide a picture-perfect setting to say “I do” and require very little work or decorations to make it a luxurious experience. If you choose one of the luxury resorts on Medano Beach, you may even be able to include the majestic images of Land’s End in the backdrop, making for both a memorable event and gorgeous pictures. The top Los Cabos wedding venues and Cabo wedding packages will add to the scene by making sure that you have all the little touches from chairs to canopies to create the perfect environment for the most magical day of your life. When you choose an all-inclusive resort for your luxury Cabo wedding, you won’t have to worry about the stresses of wedding planning because you’ll have an experienced wedding coordinator at the resort working out all the details for you. The wedding coordinator will assist you every step of the way and have connections to the best photographers, florists, and musicians to give you every Cabo wedding luxury you can dream of. Rather than trying to plan Cabo beach weddings from another country, brides who take advantage of the sensational services of the top all-inclusive resorts will have expert help on their side as they prepare their ceremonies. Cabo wedding packages come with a surprising amount of services and extra amenities that will make your wedding one of a kind. From the chairs, canopies, and officiant for Cabo beach weddings, these packages will guarantee you all the basics you need for a luxury Cabo wedding plus many extras for an incredible experience. Photography services and floral arrangements are also included in many standard packages. Beyond special touches for the ceremony, Intimate candlelit dinners, romantic spa services, and gourmet breakfast in bed the next day are just a few of the Cabo wedding luxury details that can be tailored into a wedding package just for you. Getting the ultimate experience in luxury and romance for your wedding doesn’t mean having to go over your budget. All-inclusive Los Cabos resorts offer tiers of packages with options that can fit any budget without skimping on Cabo wedding luxury options. If you shop early, you can also take advantage of promotions and deals offered throughout the year, leaving you more in your budget for your dream dress or a relaxing honeymoon. 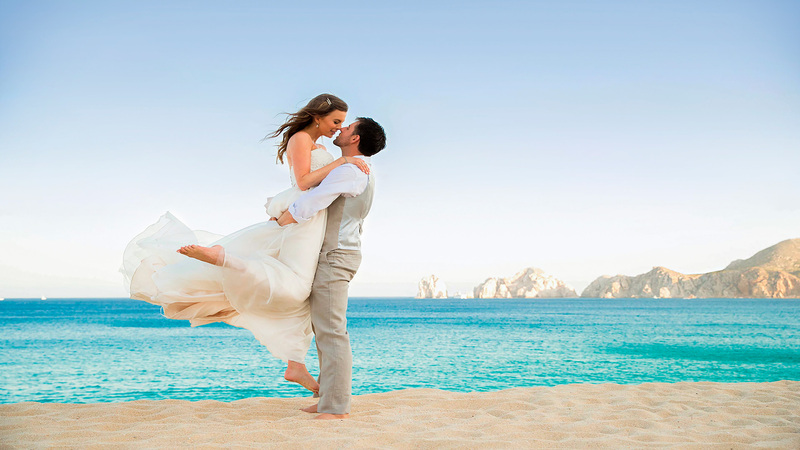 When it comes to luxury, Los Cabos is the tropical paradise for destination weddings. With beautiful scenery, world-class resorts, and incredible services, dream weddings become a reality on the beaches of Cabo. For a relaxing and celebratory day of romance, let the top all-inclusive resorts in Cabo San Lucas help you plan your luxury wedding day.